(vo͞o`do͞o) [from the god Vodun], native W African religious beliefs and practices that also has adherents in the New World. Voodoo believers are most numerous in Haiti, where voodoo was granted official religious status in 2003, and in Benin, where the religion has had official recognition since 1996. Similar observances are found in Jamaica, under the name pocomania, and in parts of the United States and in the Guianas. A highly developed voodooistic religion known as candomblé is found in Brazil. Although the magical aspects of voodoo are related to beliefs and practices found throughout the world, the basic features of voodoo were brought by slaves from W Africa, particularly those from what is now Benin, where the beliefs are still widespread (as many as 60% of the people of Benin practice voodoo). Voodoo contends that all of nature is controlled by spiritual forces which must be acknowledged and honored through offerings and animal sacrifice; ecstatic trances (a means of communicating with the gods and spirits) and magical practices play an important role in its ritual. In the New World, Christian elements were introduced, and the African deities became identified with various saints. At various time attempts have been made to suppress voodoo, but voodoo survived and continues to flourish. , religion originating in W Africa, developed by Yoruba slaves in Cuba, and practiced by an estimated one million people in the United States. Blending African beliefs with those of Roman Catholicism, it fuses Christian saints with African deities (orishas). , in voodoo, a person believed to have been raised from the grave by a houngan [sorcerer] for purposes of enslavement. The zombi is used by its master to perform heavy manual labor and to implement evil schemes. See A. Métraux, Voodoo in Haiti (tr. 1959); F. Huxley, The Invisibles (1966). a syncretic religious CULT, probably of African origin, which is pervasive among the peasantry and urban poor in parts of the Caribbean and Central America, but most particularly in Haiti. Voodoo practices involve MAGIC and WITCHCRAFT, especially the use of charms and spells. Altar in the Voodoo Spiritual Temple of Mambo Miriam in New Orleans, Louisiana. Fortean Picture Library. The term Voodoo is the most popular name for a religion developed in Haiti that is a combination of the religion of the West African Yoruba people and their Roman Catholic slave owners. Although it developed in the eighteenth and nineteenth centuries, the African elements may go back as far as five or six thousand years. Practitioners often use the Creole spellings "Vodou" or "Vodun" to distinguish the religion from the popular misconceptions of "voodoo" spells and black magic. Because indigenous pagan beliefs were suppressed, the religion was forced underground and it developed in secret. Hollywood has managed to so infect the minds of most Westerners that it is almost impossible to join in honest discussion of Voodoo. "Everyone knows" it deals in black magic and incantations carried on in the dark of night by Obeah women who speak with musical Caribbean accents. "Everyone knows" it is involved with evil spells that produce zombies or "walking dead." And there is a very small kernel of truth in what "everyone knows." But mostly, what "everyone knows" comes out of fantasy movies, not reality. similar to Hinduism. These vary from group to group; it is difficult to summarize Voodoo because there are so many different expressions. Anthropologists can't even agree who the principal deities are. Many have compiled lists of the different names for the gods, but no two lists are the same. What is known is that Roman Catholicism has shaped Voodoo culture. Both believe in a Supreme Being. The Catholic saints are paralleled by the Voodoo loa or lwa, the spirits of people who had led exceptional lives. Both religions believe in an afterlife and have, as their centerpiece, a ritual sacrifice involving both flesh and blood. Both believe in the existence of evil, demonic, invisible spirits. Both believe in the existence of the human soul, which leaves the body at death to enter the place prepared for it. Both believe in exorcism. The many ceremonies, songs, and dances of Voodoo are performed primarily to honor worshipers' ancestors or the loa. 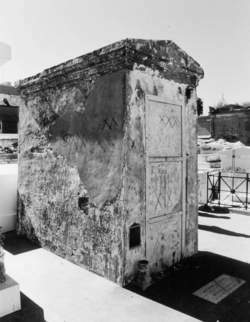 Grave of Marie Laveau, Voodoo queen in the 1830s, a place of pilgrimage for Voodoo followers. Courtesy Dr. Elmar R. Gruber/Fortean Picture Library. Like Witchcraft, Voodoo is a religion. It is not black magic and it does not consist of sticking pins into dolls. It is rather a religion of initiation, a mystery religion. Voodoo stems from the kingdom of Dahomey, on the Ivory Coast of Africa, and was brought to the West Indies by slaves at the end of the seventeenth century. The language of Dahomey was known as fon, meaning "king." The word Voodoo or Voudoun is the fon word for "spirit" or "god," or for a sacred object. The Republic of Haiti—the western part of the island that also includes the Dominican Republic—is the place most often associated with Voodoo and probably where it is practiced in its purest form. It is a religion in the sense of any other religion, with a system of beliefs, faith, and traditional rites. Religion can be defined as "the attitude of individuals in community to the powers which they conceive as having ultimate control over their destinies and interests." (Religions of the World Made Simple, Dr. John Lewis. Doubleday, New York, 1968.) This definition fits Voodoo as well as Roman Catholicism, Judaism, Witchcraft, Buddhism, or any other established religion. In Voodoo there are a number of gods, or loa, as well as a priesthood and various festivals and ceremonies. The ceremonies are held at a sanctuary or temple known as a hounfor or hunfo. These vary greatly in size and style depending on the affluence of the immediate community. Some are very elaborate with a number of peristyles (covered altar areas), while others are small buildings with a rough cement block for an altar. The priest in Voodoo is the houngan and the priestess the mambo. Ceremonies are attended by initiated and noninitiated alike. However, the initial part of the ceremony is performed by the priests, the initiates, and the shortly-to-be-initiated only, while the rest of the congregation sits and watches. Participants and audience tend to merge more and more as the ceremonies progress. The initiated are known as the hounsi, meaning "the spouse of the god." They are dressed in white at the rituals and assist the houngan and mambo, whom they call "Papa" and "Mama." Those who are going through a training period for initiation are dressed in red and are known as the hounsi-kanzo. Initiation for the hounsi-kanzo starts with a series of public prayers, led by the mambo, every evening for a period of six days. At the end of this time the hounsikanzo are blindfolded and led off into seclusion. For nine days they remain in an isolated hut. There they must lie on their beds on their left side, and may eat only food that is white in color. Only the mambo and her assistants may enter the hut during this period, which is called the couché (putting to bed). Upon first entering the hut the individual hounsi-kanzo strips and kneels. She has her head bathed with an herbal concoction prepared by the mambo, and then all bodily hair is removed. During the nine day period she learns many prayers, songs, and a variety of secret passwords and signs. On the third day her soul is ritually transferred to a pot-de-tête jar, which will be kept by the mambo on the houfor altar. The jar also holds a lock of the initiate's hair, fingernail parings, and pubic hair. DAMBALLAH-WÉDO—Known as "the Ancient and Venerable Father," Damballah-Wédo is looked upon as the source of all wisdom, the origin and essence of life. Damballah is regarded as a serpent deity. In the corner of many hounfors is a tree with a pond (or even an old bathtub sunk into the ground) beside it. This is the special home for this loa, who is also looked upon as the guardian and protector of springs, lakes, and ponds. The center post holding up the roof of the peristyle, and around which the altar is constructed, is also regarded as Damballah's tree, and he is thought to be at the top of it during the rituals. Two eggs are a particular offering for Damballah. AYIDA-WÉDO—The wife of Damballah, she is also depicted as a serpent. Together the two represent sexual totality. Their symbol is an egg (representing the world). LEGBA—A most important loa, Legba is the Guardian of the Crossroads (in this sense similar to the Greek goddess Hecate). He is sometimes referred to as Maître Carrefour, or God of the Crossroads. Legba can remove the barrier between this world and the next, so he must be invoked first, of all the loa. He is usually represented as an old man, dressed in rags and leaning on a crutch, although he is thought to have tremendous strength. His attributes are a tree, a cane, and a tall hat. AGWÉ (or Agwé-Taroyo)—The Poseidon of Voodoo. Called The Shell of the Sea, Eel, Tadpole of the Pond, he is lord of the sea and all that is in it: flora, fauna, ships, and shipwrecks. He is depicted as a fair-skinned mulatto with green eyes, dressed in a naval officer's uniform. His emblems are miniature boats, oars painted green or blue, and shells. ERZULIE (or Ezilie)-FREDA-DAHOMEY—The counterpart of Aphrodite. Considered the Great Mother and a goddess of beauty, she has an overabundance of love. She comes from a family of sea spirits. She is extremely extravagant, and she loves beautiful clothes, makeup, and perfume. Erzulie is very refined, very sensual, very coquettish. She always wears three wedding bands. There is usually a small room near the peristyle furnished especially for Erzulie. It contains a large brass bed; a dressing table covered in makeup, perfume, and powder; and a closet full of beautiful dresses, all contributed by the community. OGOUN (or Ogu-Balindjo)—Ogoun is a storm god. Basically a sky deity, he is depicted as a wounded warrior who carries an enormous sabre. He is also known as "Blacksmith of the Gods," like the Greek god Hephaestus. ZAKA (or Papa-Azzaca)—Zaka is in charge of crops and agricultural labor. He appears in peasant dress wearing a dark blue denim shirt and straw hat, with a short clay pipe in his mouth and a machette over his shoulder. GUÉDÉ—The loa of Death and Sexuality is very much a chthonic deity. He is frequently obscene in both word and gesture. He is usually depicted in formal mourning clothes wearing black spectacles. Yet he is also a great healer. In his Petro aspect he is known variously as Baron Samedi, Baron La-Croix, Baron Cimitière, and The Three Spades (grave digging tools). His symbols are a cross or a spade, a pick, and a hoe or adze. BRIGITTE (Madame Brigitte or Big Brigitte)—The wife of Guédé. She calls him "Corpse and Phallus; King and Clown." Other members of the Guédé family are Guédé-nibo and Captain Guédé, otherwise known as Captain Zombi. Each of the loa has a symbol, or emblem, peculiar to him or her, much like the sigils found in Ceremonial Magic. These are known as vévés or vevers and are drawn on the floor of the hounfor during a ritual to invoke the specific loa. The mambo takes a handful of corn meal and allows it to trickle through her fingers, making the design on the ground. She draws the extremely intricate designs with amazing rapidity yet great accuracy. At a typical Voodoo ceremony, the villagers file into the peristyle through the tonnelle and take their places on the seats and benches spread around the central circular area. The roof is usually palm-thatched and is supported on columns around the sides, with no outer walls, and with a central column around which the altar is set up. The central pole is known as the poteaumitan and is sacred to Damballah. On and about the altar are candles, bottles of rum, pots-de-tête, bundles of dried herbs, statues of Catholic saints, an iron cross, gourd rattles, and many strings of colored beads. Drummers lead the procession into the peristyle and take their positions. They are important to the rituals; under the direction of the mambo, the drummers can bring about the necessary ekstasis for possession by the loa to take place. There are three types of drum: Maman, Seconde or Papa, and Boula (Baby) or Cata. An Ogantier strikes a steel bar known as an ogan with a metal stick, producing a rhythmic staccato beat to complement the drums. With a burst of activity from the drummers, the procession starts in earnest, led by the master of ceremonies known as La-Place. He carries a sabre. Behind him come the standard bearers, carrying the flags of the hounfor and its société. They are followed by houngan and mambo then by the hounsi and hounsi-kanzo. All process into the peristyle, salute the poteaumitan, and stand in a circle about the altar. The mambo takes her ceremonial asson—a gourd rattle decorated with colored beads and snake vertebrae—and shakes it at the four cardinal points, much as a Wiccan High Priestess will walk about to the four cardinal points. She is followed by the hougan, who spits rum at those same points, again similar to the Wiccan sprinkling of salt and water. prayers, and liturgy continue with the mambo, at one point, drawing the vévé of the requested loa on the ground in front of the altar. Different loa may be asked to appear for different purposes. All of them seem anxious to appear and sometimes the wrong one comes through and has to be sent off till the one sought appears. As the mambo finishes drawing the vévé, a frenzy of drumming is unleashed. All dance about the altar, gradually intruding onto the drawn vévé. Line by line it gets trampled into the dirt of the peristyle. Eventually someone becomes possessed. Once the houngan has verified that the requested loa has appeared, the possessed person will then take up that deity's attributes. If, for example, it is Agwé, the possessed will don a captain's hat and tuck a telescope under his arm (all kept beside the altar). If it is Guédé, he will wear the black top hat and glasses and may light a large cigar. For Erzulie, the possessed will retire to the room devoted to her and put on a dress, makeup and perfume before coming back to mingle with the worshipers. A man may be possessed by Erzulie or a woman by Guédé—it doesn't matter, because to the worshipers it is the loa him or herself who is now present, not simply a person dressed as him or her. In this way, the Voodoo followers are able to relate to, and actually talk with, the gods in whom they believe. There is a generous dose of Christianity mixed in with Voodoo. For years Christian missionaries tried to stamp out Voodoo and convert its followers from their ancestral religion. Not understanding the makeup of Voodoo, the missionaries—fervent monotheists—persecuted the natives, burning peristyles, drums, flags, beads, assons, and all Voodoo trappings, naively believing that by so doing they could stamp out beliefs that had been held for generations. The Haitians, for their part, eventually assumed a mask of Christianity in order to be left alone, but they continued to practice their own religion in secret. Since St. Patrick is often depicted surrounded by snakes, Haitians used such depictions to represent the Voodoo serpent deity Damballah. Similarly, Mary represented Erzulie, St. George depicted Ogoun, and Jesus was found in the plenipotentiary Legba, for example. A Christian priest could then go to a home in Haiti and happily see many Christian emblems and figures prominently displayed, not realizing that to the people in the house these were still their old pagan gods. In similar fashion, the Voodoo followers could see the power of the Church and thus adopted some of its rituals believing they would add to their own power. 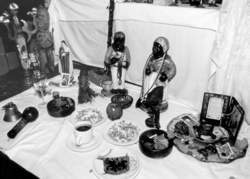 In this way a typical Voodoo ritual will include prayers, chants, Paternosters, and Ave Marias. Voodoo is found in places other than Haiti, although Haiti seems to be the main area for the religious emphasis. In New Orleans, Louisiana, for example— and in many large cities around the United States—a variety of Voodoo exists that emphasizes the buying and selling of gris-gris (charms and spells), candles, baths, powders, and other items. The Voodoo "kings" and "queens" may also be found here. In the early nineteenth century the most famous of these was Marie Laveau, a free mulatto woman who would stage huge dances on the shores of Lake Pontchartrain. Many South American countries have variations of Voodoo. Macumba, Umbanda, Qimbanda, and Candomblé are the names of the varieties of Voodoo found throughout Latin America. These are not dying out. On the contrary, even with the ever-increasing literacy rate in Brazil and the other South American countries, the followers of these different versions of Voodoo are increasing in number, perhaps because of the very personal nature of the relationship between the worshiper and his deities. As in Witchcraft, the follower is not just a spectator but a participant. The communion with divinity is absolute. The co-founders and principals of Voodoo Manufacturing are Schwartz (now 26), who is chief product officer (CPO); Max Friefeld, 26, CEO; Oliver Ortlieb, 27, CTO; and Deem, 37, CFO. He also said the company was not allowed to have anything relating to Voodoo displayed in the new office premises as it would be "against his Christian beliefs" and that he "doesn't believe in black magic. The voodoo priest still has four dolls ready to go for the upcoming four matches that Brazil is still left to play, the report added. He looked good value for that margin and while the handicapper has raised him another 5lb for that win, Voodoo Prince still looks to be well-treated at present. I contacted Victory, and the company was nice enough to send several VooDoo bolts to me for testing. Voodoo King Dave West said: "We'll be showcasing the soon to be released debut Voodoo Kings album 'System's Green'. I explained to Akakpo that as a Westerner, the word voodoo conjures up images of driving pins into wooden dolls to cause the "enemy" pain or even death. The VooDoo Dolls and the New Orleans VooDoo Arena Football team are a sign of the continued rebuilding of New Orleans as a great entertainment destination. Live music fans can be assured of an exciting guest list this festive period at The Voodoo Rooms, in West Register Street. If we had a Voodoo Doughnut in Salem, we wouldn't have to drive all the way up here to get one. PORT-AU-PRINCE: Dressed in white, shaking decorated gourd rattles and singing praises to "Olorum Papa" (God the Father), several hundred practitioners of Haiti s voodoo religion held a public ceremony on Sunday to honor those killed in the January 12 earthquake. WELSH record label Red Eye Music is releasing an album of Haitian voodoo drumming to raise funds for victims of the earthquake.